When Groups were first introduced at Hypothesis, there was only one possible configuration: Private Groups. Since then, we have created a richer groups model which includes two additional group types: Open and Restricted. The table above describes the configurations and permissions available to readers and annotators of Private, Restricted, and Open Groups in Hypothesis. Open and Restricted groups are currently available in our open-source code and to key partners as Publisher Groups. Private groups remain available to all users. Open and Restricted groups can work either with the Hypothesis account system, or with publishers’ 3rd-party account implementations. 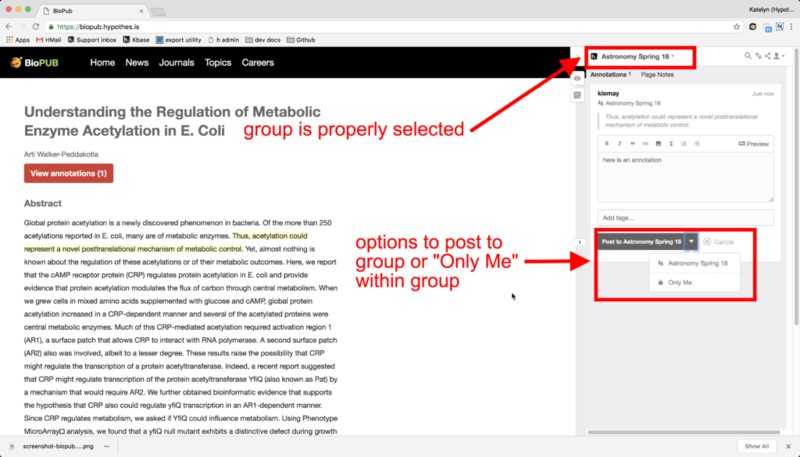 For all groups, the creator of a group has the ability to moderate annotations made in the group. 1. Navigate to the document or web page you wish to annotate. Activate Hypothesis and open the sidebar. 2. Click on the scope selector in the upper left corner of the Hypothesis sidebar. A dropdown with all of your groups will appear. Click on the name of the group you wish to switch to. 3. The scope selector will now switch to your group. When you highlight text and add an annotation, you will see an option to Post to [group name]. 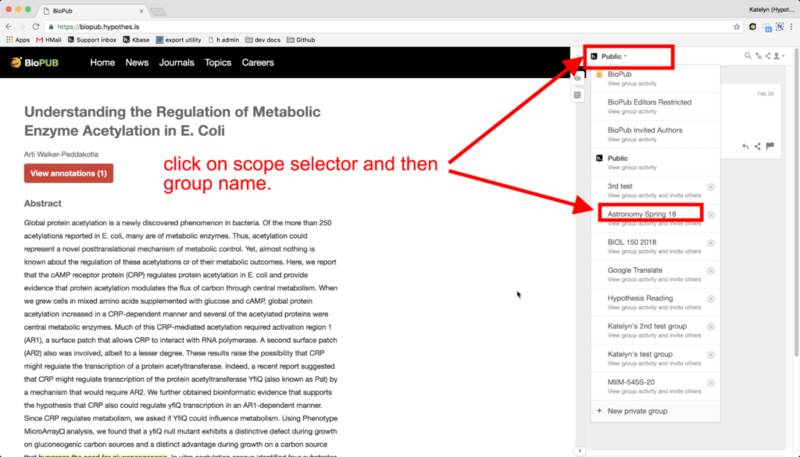 Selecting this option will allow other group members to see and reply to your annotation.